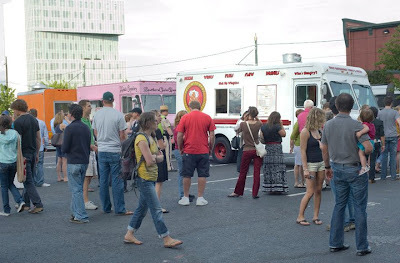 "Chow Down Uptown - A Food Truck Festival" takes place this Thursday, 5-9 p.m., for the fourth consecutive week. The event seems to be popular enough that the food trucks want to come back each Thursday and the organizer, Charlotte Center City Partners, is keeping it going. There's also been free entertainment each week, truly making this a cultural event. It's featured the likes of singer Shana Blake, guitarist Tom Billotto, a Random Act of Culture by the ASC and the NC Dance Theatre, Tom Hanchett and his old-time string band, and Quentin Talley and the Respect Da Mic slam poets group. You likely won't know what the entertainment is until you get there, giving this sort of a boardwalk feel (if only a beach and the breeze from water was nearby). Attendees are encouraged to bring their own beverages--alcohol is permitted if you’re 21 years of age or older--and lawn chairs are welcome as well. There's no charge for admission, and parking is available for $5 at the Secure parking lot adjacent to Chow Down. Keep in mind that most of the food trucks only accept cash. Find more details at www.findyourcenter.com. Has the South End food truck rally moved with all the new construction going on around it's location?